Efficient programmers are a backbone of the IT-based corporate structure. People excelled in various programming languages are hired by the companies and paid fat paychecks so that they don’t knock on the doors of their competitors. 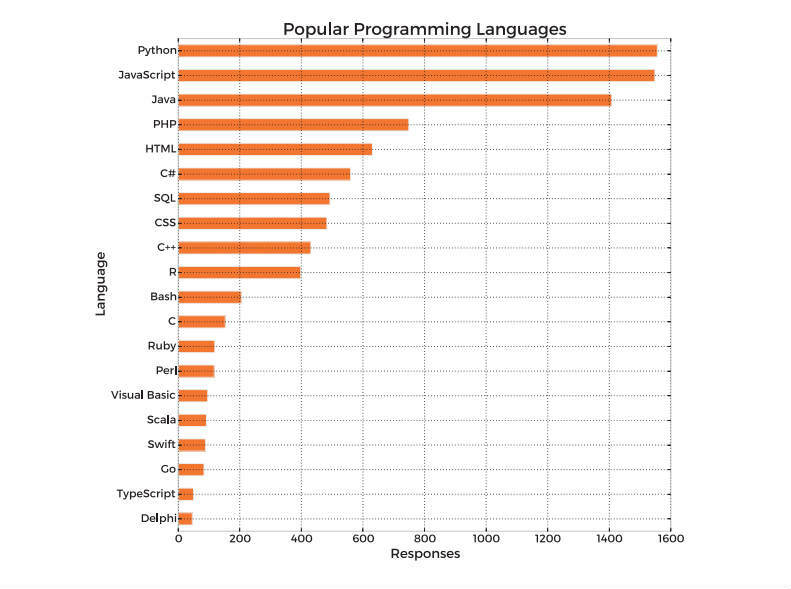 Many programming languages exist and thousands of developers work on them. 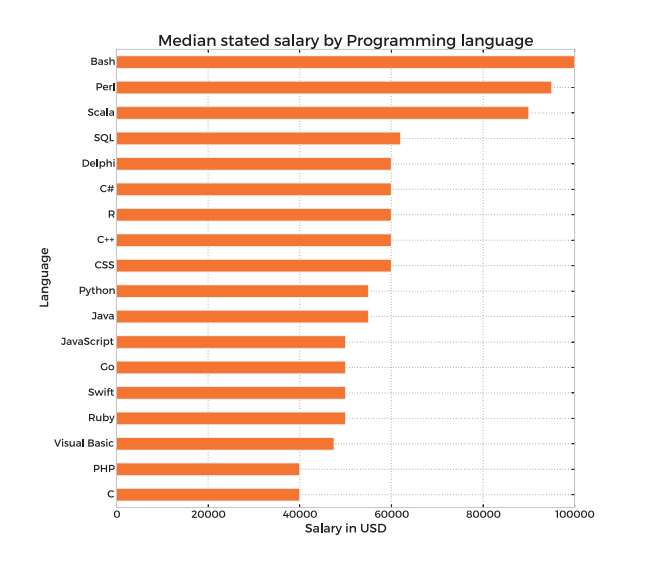 Learning some of these programming languages does pay off more than the other ones, in terms of salary. Packt, an ebook website, has published Skill-UP 2016 survey report involving the stats gathered from 11,500 developers around the world. The report describes popularity trends among various programming languages used by leading IT professionals and developers. The most number of respondents were from the US followed by the UK. The old and young C language can be seen somewhere in the middle. C is mainly used when young programmers get their hands on coding at school. So, it is obvious that a C expert might not get a dollar puffed salary bag in the corporate sector. Yet, these languages aren’t best from the financial point of view. Despite their success, developers don’t make it to the highest paying programming jobs. Expert programmers adopted languages like Bash and Perl. Thus, these languages are preferred by the companies when it comes to deciding salary structure for the jobs. Google’s Go ($50,000) language has grabbed the attention, performing better than the more popular Swift which is used to code apps for the Apple ecosystem. Golang has been designed by the likes of the veteran C but the code has been kept readable and concise. Golang has been designed by the likes of the veteran C but the code has been kept readable and concise. It is mainly adopted due its speed which comes handy for some quick coding sessions. Software engineer and application software dev are the two most opted jobs profiles for the language. A back-end web dev can also be a considerable option. 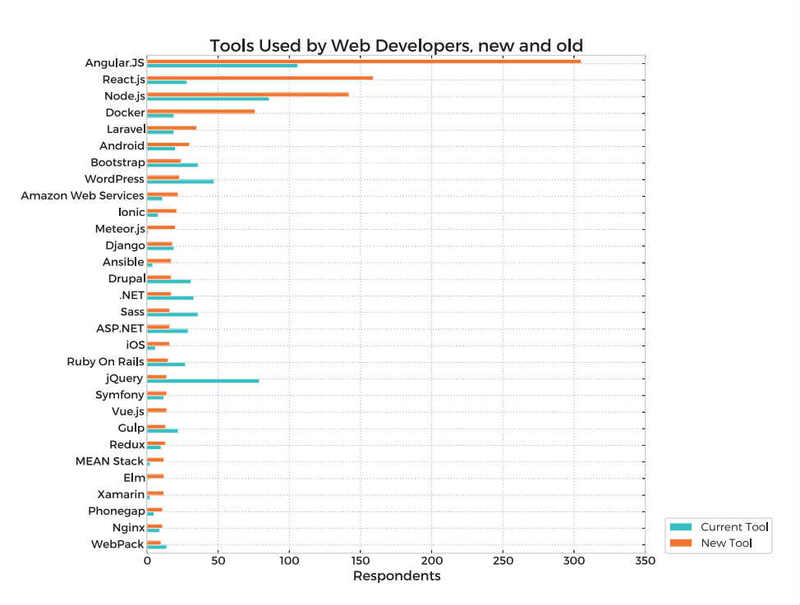 Among the web frameworks, AngularJS, is the leader of the chart. However, a considerable percentage of developers have begun or planning to shift to AngularJS 2 for which the preview was released a couple of months ago. The ones who won’t eye an AngularJS 2 shift would go for the newer Facebook-made ReactJS. 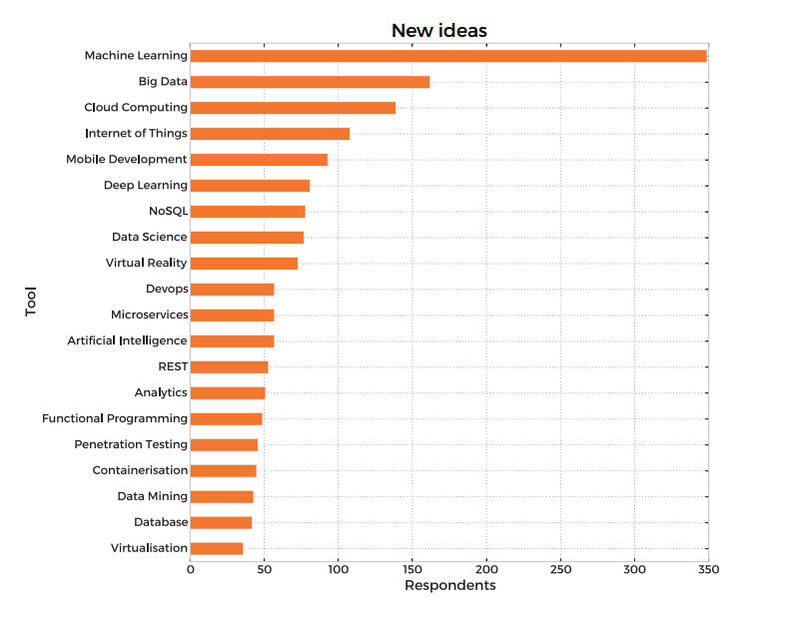 Apart from the programming language and framework stuff, the survey also throws light on the popular areas of interest among the developer community. Machine Learning and Big Data have been a hot topic among the IT industry since the last year. We recently saw how the machine learning-based IBM Watson was able to come up with an effective treatment for a rare blood cancer type. Read the Skill-UP 2016 report for detailed information.